The block BDR is a typical product and is intended for protection of adjacent underground metal designs against electrochemical corrosion. Block BDR may have one, two, three or four channels. When parallel connection of four channels, the block can be used as the polarized electro-drainage device with rated current up to 100 А with an opportunity current measure of each channel. 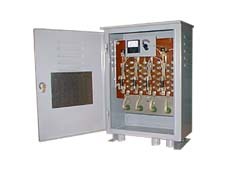 All modifications of the BDR have built-in switching ammeter (if it has 2, 3 or 4 channels) for control of each channel current. Block BDR is made in the metal case with a high-quality powder covering and designed for operation in field conditions and indoor. Also the variant of single-channel block BDR-10-1M modification is made in box of smaller dimensions. This modification has not built-in ammeter, but it has measuring shunt (75 mV) for connection of that. The blocks BDR-25 may be installed at the cathodic protection test-stations SKIP-102-2,4 on a special arm.